Crikey, this is supposed to be the end of the season, but it’s race central round here at the mo’! Not only is cyclocross kicking off (loads more rounds of the NWCCA coming up) but there’s hill climbs happening all over the place and the little matter of the WEMBO 24hr World Championships to consider too! 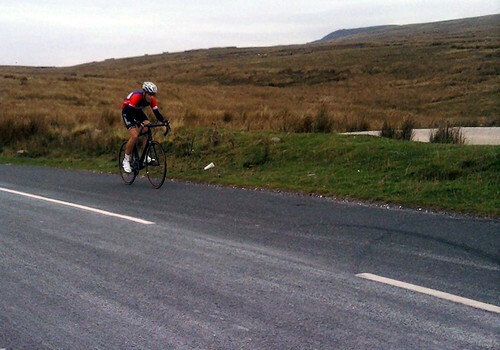 Hill climb news first: Last Sunday saw Lancaster CC’s annual grovel-fest up their local mountains*. I missed the first of the two climbs that make up their event but got an entry in for the bigger of the two – up to the Jubilee Tower near Quernmore. After heroically refusing all the cake on offer at sign on, I set about some highly unscientific warming up on a nearby, smaller hill. Lots of people were warming up on turbo trainers and roller in the car park, which is probably the more controlled thing to do, but I just fancied having a little look around the countryside before my race run. Warm up done (kind of, I don’t think it’ll go down in history as the most professional approach ever!) I got to the start to find a headwind in store for the vast majority of the course. This was a bit annoying, as I wanted to have a “proper go” at the course and see how my time in a race compared to all the “big hitters” who’d ridden it before (and see how close I could get to the course record). Oh well! Suffice to say I gave it the beans as much as I could. I didn’t get close to my max heart rate, which was a little disappointing, but remained (un)comfortably in the red all the way up, just about matching my best time in training, despite the wind and setting what turned out to be the fastest time of the day, woo! White socks make you faster up hills. Cyclocross stuff: Another race this weekend, after missing the last round of the North West League I’m heading over to Manchester to get muddy (hopefully – I’ve not got to use my nice new mud tyres yet!) and try to move further up the results sheet. A better start should help – no lingering at the back this time! Pretty much one a week after that – you need to do 9 rounds to get a final league position, so it’ll be a case of fit as many in as possible and see where we end up!